Wow! Yes, this is about the 2006 murder of Robert Wone in a house on the 1500-block of Swann Street NW. It’s important to note that the investigation is still ongoing. Why? This arrest is NOT for Wone’s murder, but for the obstruction of justice by Dylan Ward. Ward was the roommate of the owners of the Swann Street house where Wone was murdered on the night of August 2, 2006. Read on! Authorities arrested a man this week on obstruction of justice charges in the two-year-old investigation into the slaying of a prominent lawyer found stabbed in a townhouse near Dupont Circle. Dylan Ward, a resident of the home where Robert Wone was killed, was arrested Wednesday in Dade County, Fla., where he now lives, authorities said yesterday. The arrest is the first in the case since Wone, 32, was stabbed three times in the chest as he stayed overnight in the home Aug. 2, 2006. Wone was general counsel for Radio Free Asia. Read entire article. An arrest has been made in connection with the 2006 murder of prominent local attorney Robert Wone. Dylan Ward, a roommate in the home where Wone was stabbed to death, was arrested in Dade County Florida and charged with obstruction of justice, according to Channing Phillips, a spokesperson for the U.S. Attorney’s Office for the District of Columbia. Phillips said Ward was scheduled to appear before a federal court in Florida, where he now lives, at 10 a.m. Friday. He was not arrested on a murder charge; more information about the charges should be available Friday morning. Read entire article. Borderstan’s very own Diane Tucker has another campaign coverage piece on The Huffington Post, “Pre-Election Anxiety Squeezes African-American Women.” Tucker is is blogging for HuffPo’s “Off the Bus” campaign reporting series. “On the news yesterday, they revealed a potential neo-Nazi plot against Barack Obama, and then they gave more details on the racially-motivated Ashley Todd hoax. It made my heart pound. My blood pressure rose precipitously,” said anthropologist Wende Marshall, professor of public health sciences, University of Virginia. What: DCCA is sponsoring, “DC’s Financial State: Discussion with Dr. Natwar Gandhi and Councilmember Jack Evans (D-Ward 2).” A discussion of the city’s financial portrait and projections as it navigates the current economic crisis. When: Monday, November 3 at 7 p.m.
Where: German Historical Institute, 1607 New Hampshire Avenue NW. Who: Dr. Natwar Gandhi, DC Chief Financial Officer; Jack Evans, DC Council Finance Committee Chair. More Information: Email Joel Lawson or call him at (202) 215-7809. Good morning, Borderstanians. Just four days to go until election day next Tuesday. D.C. city council races–particularly those two at-large seats–are getting plenty of coverage in the media and blogosphere. The presidential race is bringing us muchos television ads, thanks to Virginia’s status as a battleground state between McCain and Obama. Washington Blade coverage from October 24. Borderstan’s boundaries are from P to S Streets and from 14th to 16th Streets NW (the center of Borderstan is 15th and Corcoran Streets NW). ANC 2B-04: West Borderstan from the north side of Q Street to the south side of S Street is in District 04 and is represented by Jack Jacobson. He is running unopposed on November 4. ANC 2B-05: West Borderstan from the south side of Q Street heading south is represented by incumbent Victor Wexler who is running unopposed on November 4. ANC 2F-01: East Borderstan (east of 15th Street) is represented by incumbent Charles Reed, the commissioner for ANC 2F-01. 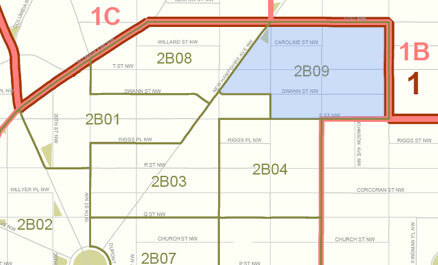 Map of ANC 2B districts. The City Council’s Committee on Public Safety, chaired by Councilmember Phil Mendelson, is holding a public oversight hearing on Strategies to Combat Prostitution, on Friday, November 7th at noon. Many people from the Logan Circle/Shaw community participated in the last hearing, which was probably two years ago. Since prostitution continues to be an issue, please consider participating at this hearing. For more information, you can reach Benardo by email or visit his ANC 2F Web page. Remember, Borderstanians, that the Saturday morning Farmer’s Market at 14th & U Streets NW will close for the season after November 22. Market hours are 9 a.m. to 1 p.m., Saturdays only. District residents who plant a tree on their property and vow to water and nurture it for two years will receive up to $50 through a program launched by the city and Casey Trees, officials announced yesterday. “We are very enthused about the improvements to the quality of life in the city that come from tree cover,” said D.C. environment department Director George Hawkins. “Any of us know the difference between walking a street on a hot summer day with trees or without.” Read entire story. The Smithsonian’s National Museum of the American Indian and the National Museum of American History are co-sponsoring a celebration of the Latin American holiday Los Días de los Muertos (Days of the Dead), with a two-day family-friendly event at the National Museum of the American Indian Mall Museum. The Mitsitam Native Foods Cafe will feature a special menu for the weekend, including roasted chicken with a vanilla-cinnamon mole sauce, two sides, and pan de muertos (a special sweet bread made in honor of the occasion). The Day of the Dead (Día de los Muertos in Spanish) is a holiday celebrated mainly in Mexico and by people of Mexican heritage (and others) living in the United States and Canada. The holiday focuses on gatherings of family and friends to pray for and remember friends and relatives who have died. The celebration occurs on the 1st and 2nd of November, in connection with the Catholic holy days of All Saints’ Day and All Souls’ Day which take place on those days. Read entire post. When: Saturday, November 1, and Sunday, November 2, 10:30 a.m. to 4 p.m. both days. Where: Smithsonian National Museum of the American Indian on the National Mall at 4th Street & Independence Avenue SW.
Information Online: See complete list of events at the Museum. Sometimes I find an event I can’t resist posting even though it costs a bit more than ten dollars and this is one of those I just stumbled on! I love the National Cathedral space and can’t imagine a better place to see this event! When: Wednesday, October 29, 2008, at 7:30 p.m.
Tickets: $18 Regular; $13 Student/Senior/Limited Income. Purchase online. Along the Red Line has a nice write-up on Halloween events for today through Friday. Prince of Petworth notes that the new CVS is getting ready to open at 14th and V Streets NW. DCMetrocentric says the Metropole building at 15th and P Streets NW is meeting its original specifications. Many people likely recall the “parking wars” that have plagued the Logan Circle neighborhood over the past several years. A quick primer goes something like this: Logan is home to both a goodly number of residents and a goodly number of churches. Since many of these churches are located along otherwise residential blocks, parking on Sundays (and other days, depending upon the schedule of the church) can be a bit messy. OK, sometimes more than a bit. It’s not uncommon to drive along R St., 13th St., Vermont Ave. and other streets on Sunday mornings and see a number of cars blocking alleys, driveways, intersections, handicapped ramps, and so on. The Historic Dupont Circle Main Streets (HDCMS) will hold the the 2008 “Taste of Dupont,” a pre-even to the 17th Street High Heel Race tomorrow night, Tuesday, October 28, 6 to 9 p.m., at the Carlyle Suites Hotel. Tickets are $65 and can be purchased online. Historic Dupont Circle Main Streets is proud to announce that tickets are now on sale for the 2008 Taste of Dupont. Last Year, over 250 attendees dined on superb culinary treats from local restaurants. The fare included scallops, lamb, oyster shots, beef tenderloin, salmon rolls and much, much more! Join HDCMS to celebrate our excellent restaurants and art institutions and help to name our 2008 Chef of the Year! Who: Historic Dupont Circle Main Streets. What: Taste of Dupont with food from Dupont Circle area restaurants. When: Tuesday, October 28 from 6 to 9 p.m. Cost: Tickets are $65 and can be purchased online. Mount Vernon Square, 801 K Street NW: The Historical Society of Washington, DC, is housed in this 1902 Beaux-Arts building. It also houses the Kiplinger Research Library and National Music Center. From Logan Circle News on Yahoo! 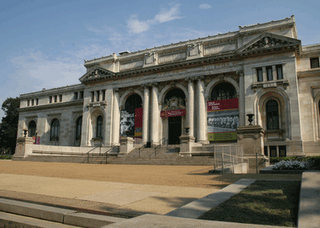 Groups… a look at what’s happening this week at The Historical Society of Washington, D.C. Through December 15: “Riots are the Language of the Unheard,” exploring issues that led to the 1968 riots. Through December 15: “Frank Smith: 40 Years Since the Riots,” works from the Black Arts movement. Wednesday October 29 at 6:30 p.m.: “The Historic Campaign: Barack Obama in Photos,” book signing and discussion with the authors. The Historical Society of Washington, DC, is located at 801 K Street NW at Mount Vernon Square. All events are free unless otherwise indicated. For more details, visit the Web site at or call (202) 383-1850. Is 14th & T Deal for Diner, Comedy Club Dead? It appears that plans for turning the large building at the southwest corner of 14th and T NW–including a 24-hour diner, theater, yoga center and comedy club –may be dead. Seems a large furntiture retailer has come along and made an offer to the owner. Two accounts of the matter, at Greater Greater Washington and Washington City Paper. Prospects for the Tryst/Diner/ comedy club /yoga studio/dance company plan for 14th and T, which has become a major campaign issue in 2B09 are looking dim. The City Paper found out that the owners have decided to sell to a big-box furniture store, Room and Board, instead. The deal isn’t totally done, and some neighborhood activists including 2B09 candidate Doug Rogers are already pushing Room and Board to pull out of the deal (which they have the option to do). We learned today that Dave Chappelle, yes the Dave Chappelle, has signed on as a potential investor with the Diner/Tryst/ comedy club planned for the old Church of the Reformer at 14th and T Streets NW, the development plan we wrote about in July. The bad news? That plan is close to imploding. Sources close to the deal say that the earlier agreement to lease the space from the current owner fell through. Rather than let their dream die, Diner/Tryst/Open City owner Constantine Stavropoulos and DC-Improv and Riot Act comedy impresario John Xereas, along with a few others–including Chappelle, a Xereas acquaintance who has D.C. roots–worked to get a deal together to buy the building. The bid is in the neighborhood of $9 million. The problem? They’re not the only ones interested. Julie of Borderstan attended the PSA 208 community meeting on Tuesday night (her meeting wrap-up is here). She also reports on the new DC Police Alert System, which sounds very interesting and helpful. Here is her summary of the new system. DC Police Alert is a new service that enables the Metropolitan Police Department to notify businesses and residents quickly about crimes that may require community action. With DC Police Alert, the MPD can send emergency alerts, notification and updates to your cell phone, pager, BlackBerry, PDA and/or e-mail account. All you have to do is sign up at http://72hours.dc.gov. The system will identify your geographical area based on the information you provide, and forward alerts that are appropriate to you. When you go to the site, click on the “Alert DC” logo to sign up for this service. This program will initially notify those who sign up regarding violent crimes, or crimes that have “actionable reports,” which is to say crimes that have been reported with very specific descriptions of the suspects. If you have actionable information regarding a crime, call 911. Do not take action on your own. If you choose to have the service contact your cell phone, BlackBerry or PDA, standard text messaging rates will apply.